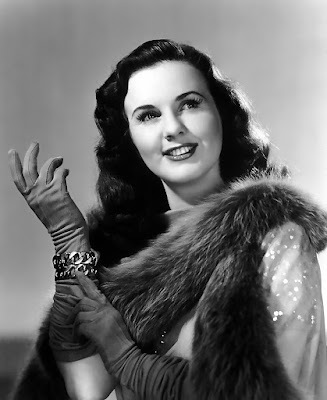 It is a new year and I have decided to cross off the films I have left on Deanna Durbin's filmography. Deanna has been one of my favorite actresses since I discovered her film Can't Help Singing over ten years ago. I choose to finish her filmography this year because it is the shortest on the list of my favorite stars. I am also able to get all the movies easily, whether it is through the TCM shop, Amazon, or eBay. I feel like I can finish her filmography and I know I am going to try my hardest to. 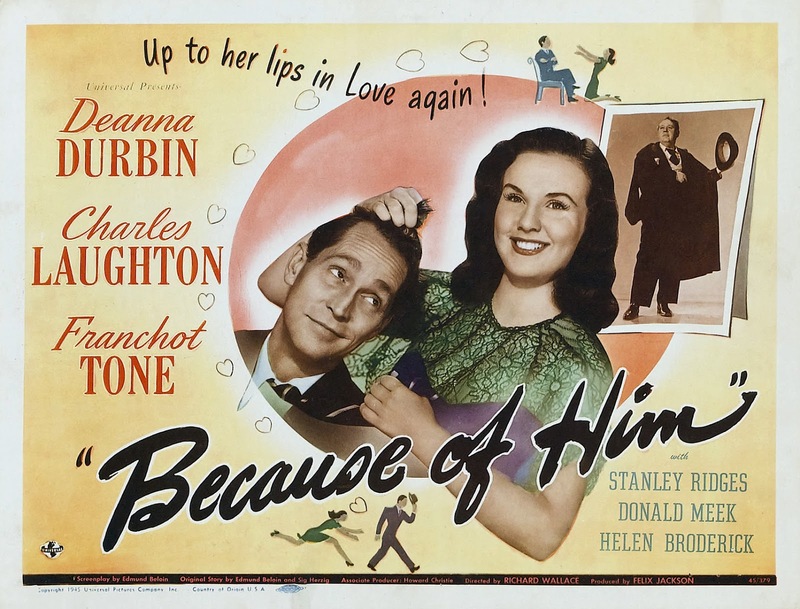 This film stars Deanna Durbin, Charles Laughton,and Franchot Tone. These two gentlemen have each starred in one movie with Deanna before this one. 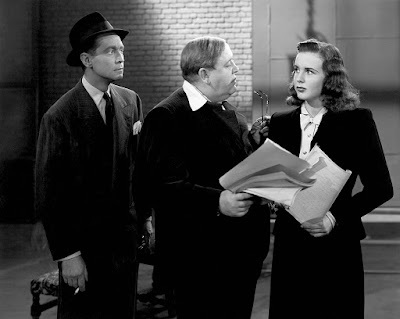 Charles worked with Deanna and Robert Cummings in It Started with Eve from 1941, a film which I love. And Franchot worked with her and Pat O'Brien in His Butler's Sister from 1943. I haven't seen this film either but I am looking forward to seeing it. The movie follows a young waitress named Kim Walker (Durbin) as she tries to become the leading lady in John Sheridan's (Laughton) new play. The film stars out with Sheridan finishing his final night on stage in the play Cyrano de Bergerac. After the show closes he goes back to his dressing room to get changed and he is paid a visit by Paul Taylor (Tone). He is trying to get John to agree on a certain actress to star opposite him in the play Paul has written. John refuses to star with the girl and leaves to go out to eat. Outside the entrance of the theater a group of fans, among them is Kim Walker. She asks Sheridan for an autograph but her paper is pushed out of the way by a teenage boy. She is upset and leaves to go to work, which she is six hours late for. Once she arrives and is badgered b her friend about having getting the autograph. Kim tells her that she was unable to get the autograph. However, John Sheridan walks into the restaurant with a friend and is seated in Kim's section. She gets him to sign the piece of paper, which is actually a letter of recommendation. In the next scene Kim is fired for being six hours late and accidentally breaking some dishes. The next day she heads over to office of John's manager, Charles Gilbert. On the way to Gilbert's office, Kim runs into Paul Taylor. He tries to get her phone number and is unsuccessful. Kim, however, is successful at convincing Gilbert that she is the perfect leading lady for John Sheridan. Just then Paul walks in and they are formally introduced. He doesn't want her in the play since she is only an amateur. He leaves after a brief argument and a party is arranged in Kim's honor. The next day Paul is shocked when he learns that Kim is not only the leading lady in his new play, but also John fiancee. A party is thrown in Kim's honor that weekend and John shows up. He is suppose to be on vacation, but he returns home in the middle of the party. Kim pretends to faint and is rushed to John's room, to avoid a scene. He is not happy she has tricked him into signing the letter. He takes her home and though they seem to get along, he tells her she isn't suitable for the play. This hurts her feelings and her roommate suggests that she fakes a suicide attempt. Kim is a little unsure at first, but agrees with the plan. The next day John reads about her suicide attempt and rushes over to see her. He realizes her attempt was a stunt, but still takes her out that night. He tells her again that she's not right for the part and leaves the room. Kim begins to sing and after John hears her. He is convinced she is right for the role. He takes her home and Paul is waiting for her at her apartment. He feels guilty because he thinks he is the reason she tried to kill herself. They kiss and he ends up finding out the suicide attempt was a plot. He get angry and storms out. The rehearsals for the play start and Paul is awful to Kim. John tries to intervene, but to no avail. The first rehearsal ends with Kim crying and Paul storming out and demanding his name be taken off the play, saying it's his worst. Kim tries to persuade him to return, but he won't and not even her singing helps to change his mind. The show opens and Paul shows up to see how things are going. He hears the audience's glowing reviews during intermission and heads in to see the rest of the show. Paul turns up back stage and John messes up his lines, so that Kim will look up and see Paul. She finally sees him and she goes back stage. The movie ends with John pulling back the curtain to reveal Paul and Kim kissing. Well, I have a few things to say about this film. Let's start with the bad things. I was not a fan of Deanna's character in this film. She is not a likable character, which is sad because she is played by a likable actress. I don't understand how Paul and John could have over looked her manipulations, especially the fake suicide attempt. The fake suicide attempt is a whole mess in itself and it just doesn't fit in with a movie like this, especially with how heavy the topic is. Suicide shouldn't be taken lightly, which I felt like it was in this film. I was also not a fan of Durbin and Tone's chemistry in this film. I didn't feel like they had enough time on screen together to establish a romantic plot. Maybe their chemistry was better in their first film, I don't know but they didn't have a lot of it here. Charles Laughton was amazing in this film and I enjoyed his performance. To me, he was the best character in the film. Also Deanna's version of the song Danny Boy is beautiful. I love that song anyway, but she sings it so beautifully. I am sure there is a version of it on YouTube if you want to listen to it. If you want to start watching Deanna Durbin films, my suggestion is to not start with this one. 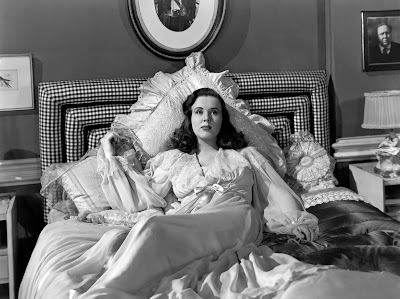 Honestly, I would only watch it if you want to finish her filmography or if you are fans of Charles Laughton and the song Danny Boy.